progressing and to let you know some of the exciting events that are coming up. Deck plank installation is still in progress and 99% complete. We will be having the “Whiskey Plank Celebration” on June 10, 2017 from 4:30 to 6:00 PM. You can purchase a deck plank piece at that time. This is a perfect gift for the person who has everything. All Deck Plank Pieces are 6 inches long. If you have forgotten the purchase price here is a reminder. The work parties are changing their course from decking to installing seam cork and prepping for tank installation. Those who have volunteered will be sent the information of dates and times directly via email. There is usually something going on every weekend so join in or come check out the progress. The KITSAP GREAT GIVE was on May 2, 2017, and we raised $2,550. Though we missed our goal, we thank all of those that donated on that day. Those that donated before 9 AM will be receiving a Kitsap Maritime T shirt. And the winner of the pie throwing privilege is Sara Owens. We’ll let you know when this is going to happen and of course, it will be recorded and posted on facebook. Recently we have been posting on our Facebook site different items that you can identify. Hereis one of the knots that is on the site. Can you identify what it is called? APRIL 23, we honored our volunteers on that date with a Hot Dog BBQ at the Kitsap Maritime Office from 12 PM to 4 PM. We presented our longtime volunteer Mark Freeland with a special “Thank You”. Here is a picture of the some of the people that attended. 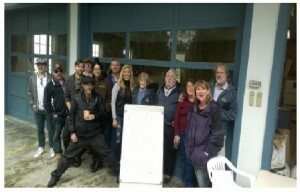 www.smile.amazon.com and choose Kitsap Maritime as your charity of choice. Then order what you want and .5% will go to Kitsap Maritime at no additional cost to you. It’s a great program and we hope you take advantage of it. They are anywhere from $40 to $1500. At this time we are offering these memberships for a 2 year period. This means it will start on January 1, 2017 and end December 31, 2018. As a member you will also receive the newsletters and other information keeping you informed of what your organization is doing. In Kind Donation – We are always looking for tools and equipment to help with restoration. If you have something you think we can use, give us a call and we will let you know. Currently we need flashlights.